Human Capital is the most precious resource in any organization. It Is the only resource that can command and control the other resources. That’s why people factor for organizational performance is of extreme importance. Every manager Is a people manager. Ensuring proper employee-care will lead to better customer-care. 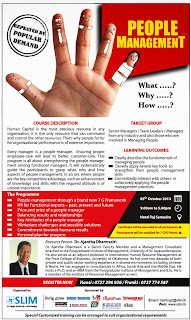 This program is all about strengthening the people management among functional managers. It will systematically guide the participants to grasp what, why and how aspects of people management. In an era where people are the key competitive advantage, such an enhancement of knowledge and skills with the required attitude is of utmost importance. Dr. Ajaritha Dharmasin is a Senior Faculty Member and a Management Consultant attached to the Postgraduate Institute of Management, University of Sri iayawardenapura. He also serves as an adjunct professor in International Human Resource Management at the Price College of Business. University of Oklahoma. He has over two decades of both private and public sector working experience in diverse environments including Unilever & Nestle. He has engaged in consultancies in Africa, South Asia and the Middle East. He holds a Ph.D. and an MBA from the Postgraduate Institute of Management and B.Sc. He is a member of the institute of Personnel Management as well.